Attackedastoria Nails: To boldy go.. Anyone who knows me, knows that I am a huge Trekkie. I adore Star Trek in all forms. I even have a uniform, that is how much I love Star Trek. 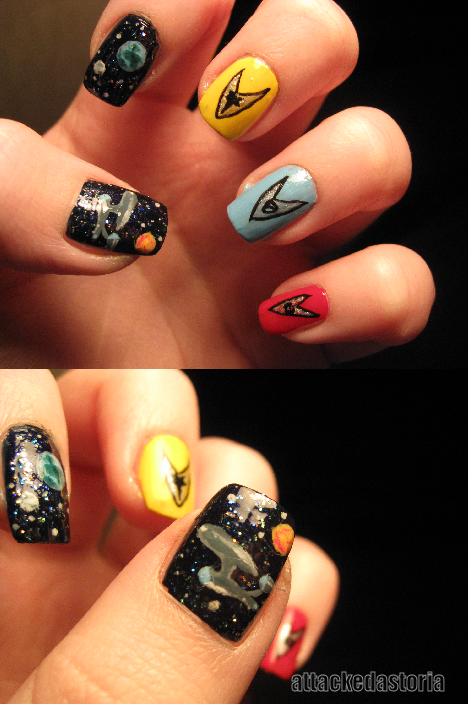 When it occured to me I hadn't thought to do Trek nails, I immediately got on with this. I love these nails, I don't give a damn what anyone says. I'd like to do another set with the rank stripes sometime in the future. I did not see how old this post is, but I absolutely LOVE this mani! Love Long and Prosper!! As the world falls down..